Ron Stutts and WCHL 1360 invited me to do a commentary on a Chapel Hill issue. I chose to speak out on the fiscally imprudent idea that we can “have our cake and eat it too”. Run this and the following four year’s budget numbers, look at anticipated impacts – funding Town retirees’ health-care, fixing Police Headquarters, meeting our clean water responsibilities under the Lake Jordan compact, the doubling in demand on our social services, etc. – and it becomes clear – we can walk away now from the discretionary Lot #5 project – at little additional cost to the taxpayer – or do the Library expansion next year. Thanks to Ron and crew for somehow squeezing 10 pounds of commentary [MP3] into a 5 pound bag. Amazing! Jan. 25th the Council considered two projects with major financial impacts – the Library expansion and the problematic Lot #5 private/public development project. After discussing their options at length, they decided to postpone approval of the Library expansion pending a more thorough review of the Town’s spending priorities during the Town’s normal budget process which, by the way, kicks off Wednesday, Feb. 3rd. This was a reasonable and prudent course of action given the serious fiscal condition of the Town, the weakened economy, continued expectations of poor revenues and Council’s touted commitment to public participation. Unfortunately, the Lot #5 project didn’t get the same level of concern. The Town’s debt has doubled to $55M over the last 5 years. It’s been used to fund necessary and discretionary capital improvements like the construction of the new Aquatics Center – which at about $7M was almost on budget – and the Town Operations Center – which at $52M went roughly $10M over-budget. Supporters claim the typical household will ONLY pay $40 more a year but that $40 only covers the increased cost of operating the Library and not the cost of discharging the $16M bond debt. The Town Manager says that as we payoff existing obligations we can issue new bonds without increasing taxes. 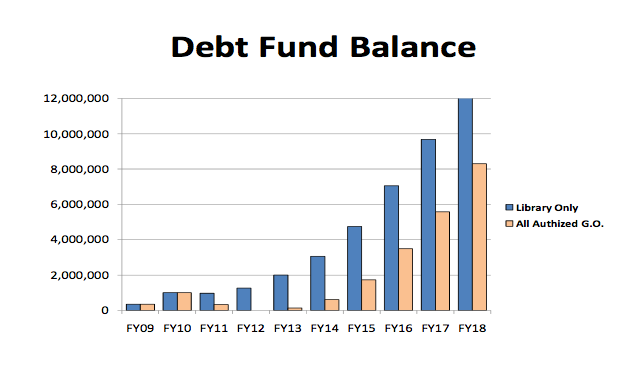 This might be true through 2011, but as the Town’s finance director pointed out, from 2012 on the construction debt pushes our overall debt very close – maybe even exceeding – the level necessary to keep our Town’s AAA bond rating. At that point a tax increase is certain. The Town Manager’s analysis is also rather one dimensional – challenges like the Town’s rapidly growing unfunded retirement obligations – projected to be as much as $56M or replacing Police headquarters – $10M if Council had purchased Dawson Hall – were not considered. So what about Lot #5? Lot #5 requires 8 to 12M taxpayer dollars and represents the Town’s greatest, riskiest discretionary fiscal liability. Part of the sales pitch for Lot #5 was the supposed need to stimulate development Downtown. With Greenbridge nearly built and other Downtown projects on the way it’s clear that we didn’t need a stimulus. In fact, directly across Franklin St. the University at University Square is already putting forward a much more interesting, integrative proposal which better fulfills the goals of the Lot #5 project – and at little cost or risk to our taxpayers. Given that the cost reductions that allowed RAM Development to lower their gold-plated condo prices haven’t been passed on to the taxpayer, that the number of pre-sold units hasn’t grown in-line with those price reductions, and that the Town still doesn’t know how it plans to borrow that $8 to 12M – now is the time to drop Lot #5. Three years out – three contract extensions granted – no significant improvement in proposal. What does this have to do with the Library? We can have a Library expansion – hopefully starting next year – or we can have Lot #5 – we can’t handle both. Contact Council – ask them to pull the plug on the Lot #5 project now so that we can take on projects that are more central to Council’s charter. More information on my website, CitizenWill.org. Here is what I meant to say at this evening’s Council meeting. Like a lot of my remarks, I find myself editing on the fly, so what I managed to get out in less than 3 minutes wasn’t quite what follows but I believe I made the points I needed. We can’t do the Lot #5 (140 West) project and the Library expansion together. Lot #5 hasn’t met its goals, the cost/benefit ratio is decidedly out-of-whack, the necessity quite clearly not there anymore. Further, the Library expansion project needs to be delayed until taxpayers can bear the total cost. Beyond that, we need to request an extension from the North Carolina Local Government Commission to allow issuing bonds beyond the current deadline so when it is fiscally prudent we can move expeditiously. Finally, public participation, once again, is barely considered. In 2010 you will be making several key budgetary decisions whose impacts will span the next decade – the Lot #5 (West 140) and Library expansion – two examples. Lot #5 represents the greatest and riskiest fiscal liability going forward that can be safely dispensed with. Part of the sales pitch made by some on this Council is we needed this project to kick-start development Downtown. With Greenbridge nearly built, University Square poised for redevelopment, approval of Grove Park – which will displace the affordable Townhouse Apts. on Hillsborough St. with luxury condos – and other Downtown projects on the way it’s clear that we don’t need that supposed stimulus Lot #5 brings anymore. 2) the number of units pre-sold hasn’t grown in-line with price reductions (33 units pre-sold so far, down from the reported 2008 commitment of 35). 6) and from what I can see in RAM’s recent missive ( RAM Dec. 22nd, 2009 letter [PDF]) no effort has been made to involve the nearby business and residential community in discussing mitigation of the type of construction-related problems that have plagued Greenbridge or even apprise their future neighbors of current developments (let alone present a coherent and consistent story to the local press). Three years out and no significant improvement in the proposal. Three extensions to the contract granted by Council. Lot #5 should be shelved now so that the Town can take projects that are more central to its charter. I want to see the Library expanded but now is not the time. The memos before you [here] paint a fairly rosy picture of the borrowing in terms of adopting new debt but they don’t do a very good job in putting that increased debt in context of our already astonishing – at least by historical Chapel Hill standards – debt load. Memo #A, in fact, disingenuously characterizes the increase to homeowners using examples of property valuations well below ($200K) the Chapel Hill baseline. Look at the chart in Memo #A. The rate of increase in the debt load – that rapidly increasing impact on the Town’s flexibility in borrowing – running our debt right up to the debt ceiling for our AAA bond rating – starts in late 2012 and zooms steeply from there. Of course, besides adding new debt that and anticipated G.O. additions will account for roughly several cents on the current tax rate while the real kicker is the growth in cost of Library operations – which appears to be even more significant. Worse, the continued structural instability and weakness of our economy gets short shrift. Now is not the time to take on a large forward liability. Making a decision based on these figures tonight will be guaranteeing a tax increase or steep cuts or just ignoring basic obligations two years hence. 1) Shelve Lot #5. We can have a Library expansion – hopefully starting next year – or we can have Lot #5 – we can’t handle both. 2) The Library borrowing should be delayed until prevailing economic conditions show signs of improvement – strengthened sales tax revenues, stable fund markets which will lend money at a more favorable rate – say less than %100 of the 20 year Treasury bond ratio. 3) Have staff prepare a request to NC Local Government Commission to extend Chapel Hill’s time limit for issuing these bonds so the Council and community have adequate time to plan. 4) Use the established public budget process which kicks off next week [2/3/2010 7:00 PM Council Chambers Townhall) to discuss the Library in light of all our Town’s needs – competitive staff wages, affordable housing reserve funds, the growing retirement fund deficit (Unfunded Liabilities: Pay As You Go Not Sustainable) among many others. Last Fall many of many on Council obligingly participated in a special “emergency” meeting to acquire Dawson Hall for police and other key Town services. That urgent need hasn’t gone away – the police department’s facility still needs attention – why isn’t that part of the rosy projections? Our citizens deserve a diligent evaluation of the cost of the Library expansion and operations within the context of our total budget and foreseeable needs – not wants. They also deserve to participate – not just get an agenda item 3 days before a decision is scheduled. 5) Finally, postponing tonight will give you the opportunity to carefully consider this proposal in light of all your priorities, give you time to evaluate the rosy picture drawn by these memos against your own understanding of the economy and think about how to engage the community during this weekend’s Council retreat. In addition, it buys needed time for the public to review the current proposal, attend the budget sessions, ask their questions, get their answers and finally weigh in in a thoughtful manner. Consideration of Proceeding with the Library Expansion Project: The Council considered the project schedule and associated costs for expansion of the Chapel Hill Public Library. The Council delayed action and indicated its desire to discuss the expansion costs in greater detail and in the context of the entire Town budget. The Council stated it wants to know what level of funding Orange County will provide toward Library services. Orange County provides no capital support toward the Town’s Library expenses; this includes all past and present Library construction costs, debt service for same, equipment or special project costs. County support toward Library operating expenses has remained at $250,000 since 1995 and represents 11 percent of this year’s Library operating budget. About 12,000 of the Library’s patrons live in Orange County outside Chapel Hill limits. The number of materials borrowed by these patrons was 386,000 items last year. This represents approximately 40 percent of the Library’s annual circulation. Even if the “development process is broken in Durham”, as LaDawnna Summers, who resigned from Durham’s Planning Commission over the Lake Jordan mess, it is important that both Chapel Hill’s elected folks and greater community engage directly in the NC54/I-40 corridor planning process. Thirty years ago, when I first came to Chapel Hill, I drove into town on the scenic two-lane NC54 (I-40 from RDU on was still a set of dotted lines on a map). The beautiful pastured hills to the north are now covered by Meadowmont. The woods and vales to the south, by the Friday Center and office parks. And the majestic hill-side entry to the University? Now obscured by the “anywhere USA belt-line architecture” of the road hugging East54. When: Wednesday, November 18, 2009, from 5 p.m. to 8 p.m. The Durham-Chapel Hill-Carrboro Metropolitan Planning Organization (DCHC MPO) will host an interactive community workshop on November 18 to obtain guidance on developing a blueprint for mobility and development in the NC-54/I-40 corridor, a critical gateway linking the City of Durham, Town of Chapel Hill, and University of North Carolina at Chapel Hill. The NC-54/I-40 corridor serves as one of the major gateways between Chapel Hill and southwest Durham, with its interchange with I-40 consistently ranking as the top congested location in the region. Development pressures within the corridor coupled with mobility and capacity issues have highlighted that the existing and planned transportation infrastructure is insufficient to accommodate growth and address land use and transportation problems. To develop land use and transportation strategies to preserve this important corridor, the DCHC MPO, the City of Durham, Durham County, and the Town of Chapel Hill have begun a corridor study to analyze short- and long-term land use issues and multi-modal transportation problems, evaluate opportunities and challenges, and recommend short- and long-range land use and transportation solutions and strategies along the corridor. Categorize strategies into near, mid-term, and long-term phases. workshops will be held as a part of this study, which should be completed in June 2010.
alternatives and seek public input in the selection of the preferred scenario. The third workshop, tentatively scheduled for spring 2010, will give participants an opportunity to review and refine the corridor master plan and provide input on setting priorities for multimodal transportation and land use strategies, implementation strategies, and phasing. The total cost for the study is $257,432 with 80 percent of the funding coming from federal transportation planning funds and the remaining 20 percent funded jointly by the City of Durham, Durham County, and the Town of Chapel Hill. Residents interested in joining a group of citizen contacts for this study should contact Leta Huntsinger with the DCHC MPO at (919) 560-4366 ext. 30423 or via email at leta.huntsinger@durhamnc.gov. For more information about this study, visit www.nc54-I40corridorstudy.com . I was appointed as one of the “at large” members of the Town’s Sustainability Task Force several months ago. One of the first issues we took up was representation on the task force itself. Essentially, did the task force membership represent the reasonably broadest possible diversity of viewpoints and experience we needed to craft a sustainable game plan covering Chapel Hill’s growth these next 10 years? Along with most of the task force, I agreed it didn’t so we asked the Council to grant us permission to broaden our membership and renew the call for volunteers. I’ve been calling folks I know, sending emails, talking to various organizations that might otherwise be disinclined from participating to try to get new members who will broaden our task forces’ perspective. The task force will resume its work mid-August by adding 6 of these 10 (or more I hope) applicants to the position. I will be reviewing these and any other applications with an eye towards choosing folks that have a distinctly different vision of where Chapel Hill should be in 10 years. By maximizing diversity of considered opinion we should not only end up with a stronger set of recommendations but also a message that is widely acceptable. Seems like the municipal elections are officially on. Kevin bowed out as mayor. Mark bowed in. Laurin, not surprisingly, ready to go again. And now Penny. I ran with Penny in 2007 and welcome her 2009 run. She did her homework, was firm in her convictions, eloquent and handled some rather nasty rebukes by two of the incumbents with grace and good cheer. I’m hoping that this year, unlike the 2007 campaign where the incumbents orchestrated an issues shut out, will be a year in which the rather substantial problems before our community get not only a fair hearing but elicit specific proposed remedies by the candidates. I am proud to announce my candidacy for Chapel Hill Town Council. While running in the 2007 council race I was honored to meet many folks that live and work in Chapel Hill who share my love for this beautiful town. Chapel Hill has a bright future, and I believe I would be a positive addition to the Town Council as they guide us through the next phase of growth. As a small business owner raising a family in Chapel Hill, I represent the unique perspective of the average everyday citizen. In the coming months I look forward to talking to the people of Chapel Hill to gain an understanding of their priorities, needs, and concerns. I can best represent Chapel Hill by ensuring that everyone has the chance for their voice to be heard as we shape the future of our town. Though I wished UNC had clinched the ACC championship, tonight’s 89-72 stomping of Michigan State provided a conclusive and satisfying end to UNC’s great 2009 basketball season. In case you haven’t heard the rumble rolling forth from Downtown, UNC fans are as jubilant as the players. I’ve had the uncanny luck to have seen the 1982, 1993, 2005 and, now, the 2009 national championship celebrations and this one, at least as of 1:35am, seemed to be one of the best managed – no burning cars, major fires or parking lots full of triaged injured fans. Kudos to Town staff, UNC/Chapel Hill/State and local law enforcement, our fire and rescue personnel (who, I presume, missed most of the game prepping for the turnout) and all the other folks that made this year’s celebration a reasonably safe affair. Congratulations to Roy Williams, the team and the University for an exciting demonstration of excellence. I’m at the roll-out of tonight’s UNC explanation of the tardy (a year late) Tischler-Bise Carolina North fiscal impact study. The classroom at the School of Government is fairly packed with elective and governmental staff folks (about 45 from all three governmental bodies – Chapel Hill, Carrboro, Orange County). Beyond a smattering of media folks (Daniel with the Chapel Hill Herald, Jesse with the Chapel Hill News), there’s a handful of concerned citizens. Other than those “required” to be here (if at least for no other purpose than to say they were there), some of the “usual suspects” include Penny Rich (former candidate Town Council), George Cianciolo (Chapel Hill planning board), Scott Radway (former planning board member), Joe Capowski (former Council member), Terri Buckner (former Tech board member among other civic posts) and myself. Further comments follow as comments on this post. I haven’t said much about the fluffy TischlerBise fiscal impact study commissioned and worked on jointly by UNC’s administration, our local governments and TischlerBise’s consultants. Fluffy? Like previous UNC commissioned analysis – notably the previous Carolina North and Orange County Airport Authority economic justifications – the upside is mostly in intangible (i.e. hard to measure, hard to hold accountable for) benefits and the downside – in hard currency – mostly downplayed, low-balled. Carolina North could be a great asset to the local community but UNC cannot shift millions of dollars of costs onto the shoulders of local residents. No matter how the consultants twisted the numbers it is clear that Chapel Hill will take a significant financial hit as Carolina North – the question now is how much? The consultants who prepared the fiscal impact analysis for Carolina North will present their final report to the public March 31. The presentation will begin at 7 p.m. in the Wicker Classroom (2603) at the School of Government on the campus of the University of North Carolina at Chapel Hill. Free parking is available after 5 p.m. in the School of Government parking deck, with additional paid parking in the N.C. 54 visitor’s lot and the Rams Head deck. Chapel Hill Transit service is available via the RU, G, S and V routes. At least $15-20 million over the next 10 years or, roughly, 3 to 4 cents per $100 valuation per year of additional tax burden (on-top of our contributions via North Carolina State taxes).